Lounge in the lap of luxury at Two Bunch Palms Resort. Surround yourself with serene views, indulge in their full spa menu, and rejuvenate in the Grotto with two hot spring soaking options. Tantalize your taste buds with fine dining and drift into sweet dreams in one of Two Bunch Palms’ peaceful rooms or suites. Ancient mineral waters cascade into mood stabilizing, lithium rich hot spring pools. The larger is perfect for that extra long soak at 99*. Heat up your soul in the smaller pool checking in at 104*. 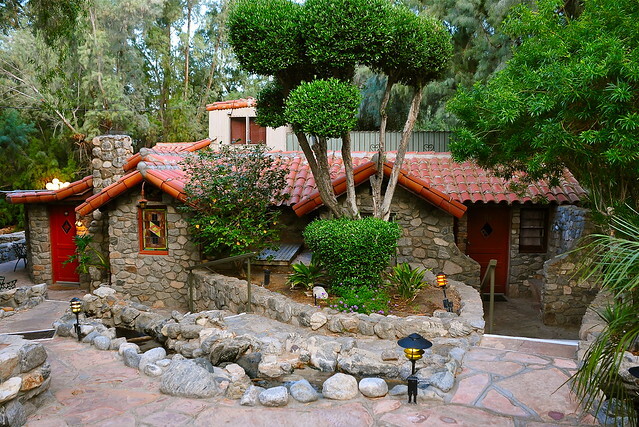 For over 60 years, Two Bunch Palms hot spring waters have brought their guests’ revitalization and relaxation. Before or after your soak, be sure to partake in one of Two Bunch Palms Resort’s spa options. From massages to mud baths and facials, they are available to pamper you. Gaze upon the mountains while you feast at the Casino Restaurant, Two Bunch Palms’ gourmet dining. They offer locally procured food to delight your senses in a quiet setting. Fifty-six acres of giant tamarisk trees, swaying palms and meditation lakes encompass Two Bunch Palms Resort. They offer a variety of 52 rooms for your stay. From elegantly decorated standard rooms to exquisite suites, you will find everything you need. Two Bunch Palms Resort is located in the town of Desert Hot Springs, CA. It lies East of Palm Drive and South of Hacienda Ave.